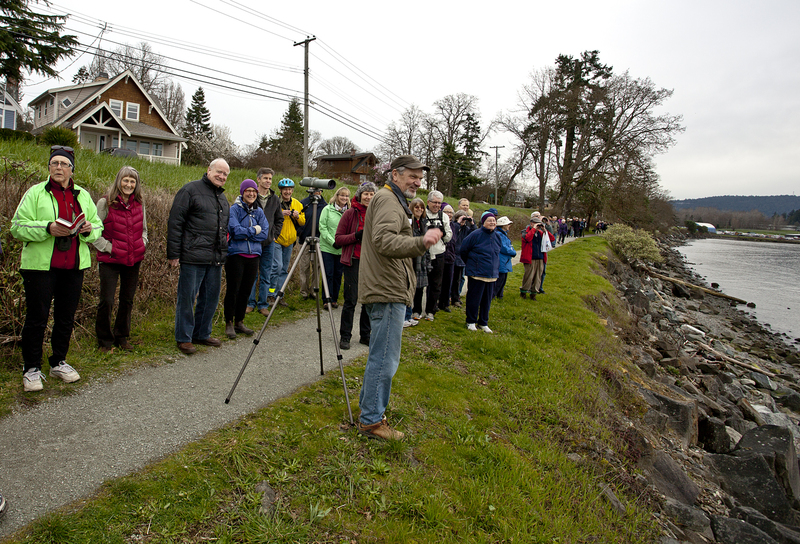 Attendance exceeded all expectations as about 60 to 70 FOSH members and supporters turned out for the Guided Bird-Watching Stroll (March 1st, 2015) at Patricia Bay Park. Attendees arrived to enjoy the clear weather and listen to naturalist, Kerry Finley, talk about the waterfowl foraging in the shallows off Scoter Trail. The birds cooperated by gathering in variety and numbers for us to examine with with cameras, binoculars and spotting scopes. Luckily other attending experts, such as Dave Bird, ably provided information for those at the back of the group on the narrow trail. Following the walk, almost all of the group repaired to St. John’s United Church the for refreshments and an information session. After setting the stage with a slideshow highlighting the natural beauty of our Peninsula, presenters informed the audience about the Friends of Shoal Harbour Society, its current and its planned activities. When attendees were asked if they would enjoy similar gatherings in the future, the response was an enthusiastic “yes” and many good ideas were offered. Our thanks to the presenters, who managed technical issues, informed and inspired us. A big thanks, too, for the wonderful support of the FOSH members very helpful spouses. Last, but certainly not least, thanks to the attendees for giving us the encouragement to move forward with our projects and to plan more community activities. Watch this space for formal notice of our annual general meeting, currently scheduled for Saturday, June 27, 2015 at Lillian Hoffar Park on Tsehum Harbour. We’re proposing a short meeting, a picnic and other enjoyable activities in this beautiful space.